Hibiscus is a flower that grows primarily in tropical regions. There are many uses for this plant. It can be used for flavoring in soups, sauces, and jams or leaved in salads. It can also be used for medical purposes. According to WebMD, “Hibiscus is used for treating loss of appetite, colds, heart and nerve diseases, upper respiratory tract pain and swelling (inflammation), fluid retention, stomach irritation, and disorders of circulation”. Although, it is mainly used to lower blood pressure. It also lowers the amount of estrogen in the body, therefore should not be taken during pregnancy or on birth control pills (Kaye). Hibiscus tea lowers blood pressure by it’s, “diuretic properties and mild effects on dilation of blood vessels”, according to Maureen Williams, ND, of the Bastyr Center for Natural Health in Seattle, Washington. People on blood pressure medications should contact their physician about any contraindications when taking Hibiscus supplements. Hibiscus Tea contains bioflavonoids which help lower cholesterol and imrpove body circulation (LIVESTRONG.COM). 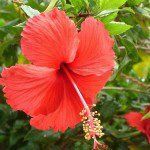 Hibiscus is unsafe to take during pregnancy because there is some evidence that hibiscus might start menstruation, and this could cause a miscarriage (WebMD). Kaye, Susan. “Side Effects of Hibiscus Tea.” LIVESTRONG.COM. N.p., n.d. Web. 02 July 2012. .
“Hisbiscus Uses, Side Effects, Interactions and Warnings – WebMD.” WebMD. WebMD, n.d. Web. 02 July 2012. “Hibiscus Tea to Lower Your Blood Pressure.” Bastyr Center for Natural Health. N.p., n.d. Web. 02 July 2012..